1. For some months now, our mother who's 33 years old, (with very little education), has been paralyzed from waist down. 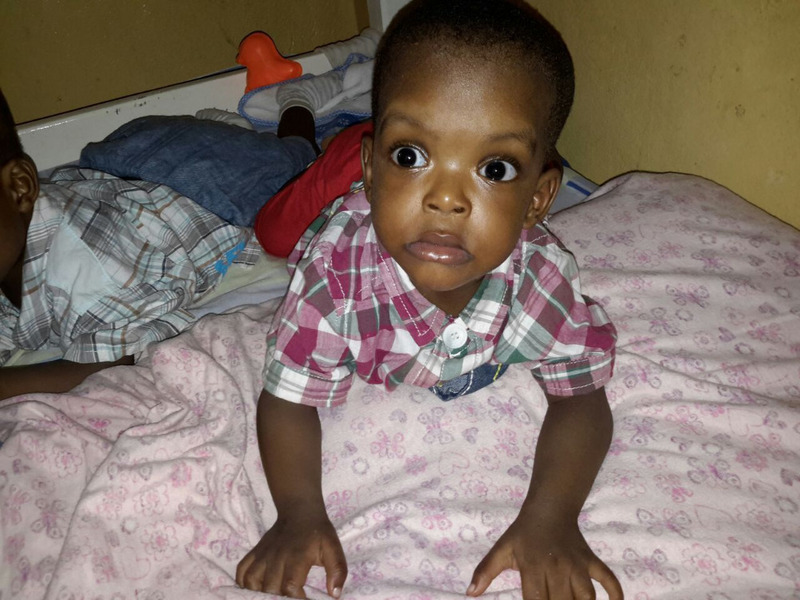 She underwent spinal cord surgery in BBH, where she stayed from January to February 2015, and has still not recovered. 2. Our father, (Julius Banla Ndi), is a 38 year old local photographer who is barely able to feed himself, let alone feed the family. Besides, he had to leave Douala (in the Littoral Region) where he was working on April 4 2015 and return to Luh Village in Ndu Sub-Division in the Northwest Region, so he could look after us. We were breastfed for the first 7 months of our lives but we are now fed with Guigoz while our mother pursues treatment for her paralysis in a neighboring village. We have an older brother, NOEL, who is 6 years old. 3. It is also feared that, the older WE get, the more complicated it might be to separate us. 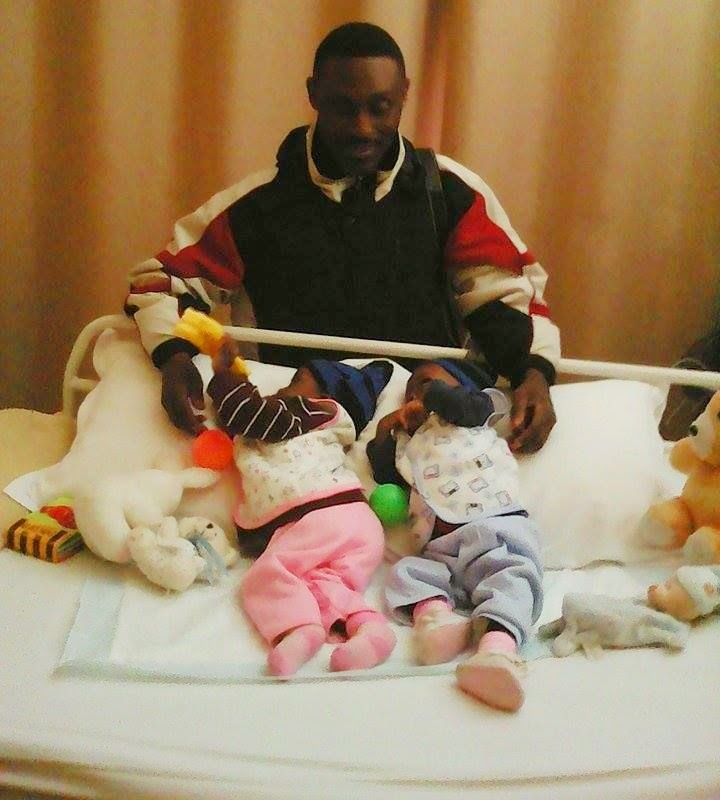 This FUNDRAISER has therefore been set up to raise the money necessary to give us INNOCENT, PRECIOUS, LITTLE BABIES that we are, a fair chance at life, and our PLEA is that you will find it in your kind and compassionate hearts to assist our family which is currently in no position to take care of the multiple challenges it is facing. Hopefully, with your help, we just might be able to get the very costly SEPARATION SURGERY that is necessary for us to SURVIVE and lead NORMAL LIVES. With your help, we might get the chance to say "THANK YOU" to you in person, in a few years!!! Now, WOULDN'T THAT BE NEAT? 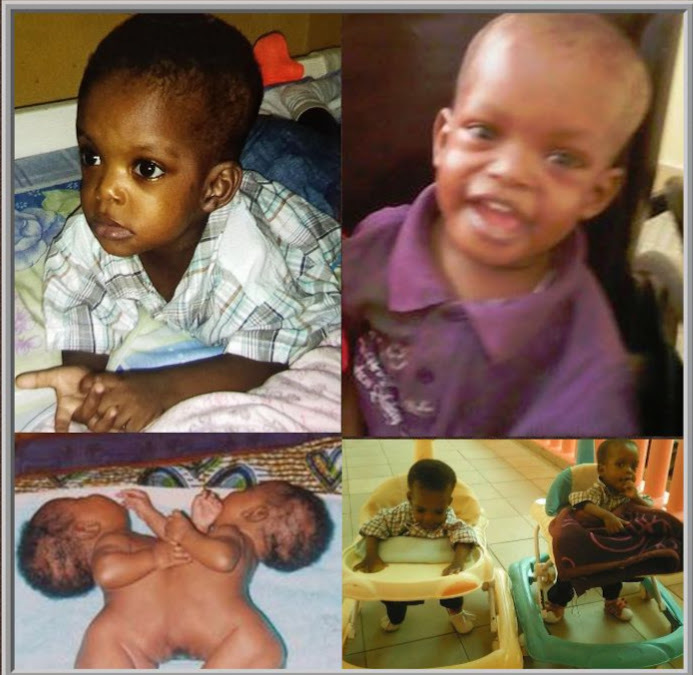 Today is August 1st 2016, and so, in the best of worlds, DAVIS & DARYL NDI, whom we first got to know as "THE CONJOINED TWINS", would have celebrated their 2nd Birthday, in just 26 days, and that would have been 1 month short of the first anniversary of their successful separation surgery which took place in Tunisia on September 15 2015. Sadly, if any celebrating does occur on August 27th, it would not be here on EARTH, because DAVIS NGIRNYU NDI joined his brother DARYL NFIHNYU NDI in Heaven on JULY 14 2016, exactly 2 months to the day after his brother left us! It has taken me a very trying couple of weeks to wrap my brain around this Second Tragedy. Not quite sure I am done processing the whole situation or the ABSURDITY surrounding BOTH deaths which, only my belief in a SOVEREIGN GOD, prevents me from qualifying as "AVOIDABLE"! My GRATITUDE - and CONDOLENCES to you all who did what you could to keep these 2 Angels in the Land of The Living for as long as The Almighty allowed them to be. To be honest, there were moments - especially BEFORE their separation, when I did worry that we just might lose one of our beloved conjoined twins. After their separation and subsequent return to Cameroon about 6 months ago, any lingering fears were limited to just DAVIS who has, in fact, faced a number of significant health challenges. To learn last night that VIVACIOUS DARYL, by far the healthier of the two, passed away yesterday as a result of what can only be termed a "FREAK ACCIDENT" was, and still is such a SHOCK! A BRUTAL, CRUEL, JOLT OF A SHOCK! An OBITUARY in his Memory has been posted on the Page that has told his story from day 1 and documented his brief sojourn on this earth, NKOTI FRANÇOIS DANCE MOVES and all!! WEH!!!!!!!!! May The Almighty console his heartbroken parents, guardians and all of you, his countless well-wishers. May it also please HIM to keep and sustain his Twin Brother, DAVIS!!! REST IN PEACE, PRECIOUS CHILD! REST IN PEACE, BELOVED DARYL! They still have hurdles ahead of them, (physiotherapy especially), but TODAY, all I can think to do is holler "THANK YOU, LORD" and trust that He who has brought them thus far will brilliantly finish what He started, to the Glory of His Own Worthy Name!!! Needless to say, our sincere GRATITUDE is also extended to the SURGEONS, DOCTORS & NURSES in CLINIQUE CARTHAGENE and I would be remiss if I did not include the Cameroon Government in my vote of thanks, given that they did eventually STAND UP & TAKE CONCRETE ACTION! They have been separated successfully. Still in the reanimation. DO WE SERVE A MIGHTY GOD OR WHAT????????!!!!!!!!!!!!!!!!!!!!!! We wanted so much to have these little boys here with us on earth. But the angelic choir was desperately in need of the voices of two little boys to round out its glorious sound. These two dear ones were hand selected by their Savior as the perfect ones for the job! We grieve here below, but these little boys rejoice in the presence of their Lord; and wait for the rest of us to join them in glory! Condolences to their earthly family, of course, but a deep and abiding faith that we too, will be with Davis and Daryl blending our voices with theirs in song someday! Sing out ye newest of the angels! Amen! God bless these beautiful babies and their family. May they grow from strength to strength. And may God reward you Sis Egbe for your generosity and kindness.